John Keeling is drawn to the transparency of watercolor. Its elusive and unpredictable nature makes it both a challenge and a delight for him. With watercolor, John is able to capture the essence of his subject, be it the fragility of a delicate flower or the devoted gaze of a beloved pet. Although a painter, John begins each piece by drawing. Using pencil or ink, he establishes a likeness before he begins painting. He is then set free to paint with spontaneity and joy. 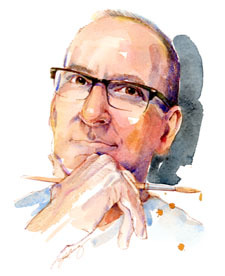 When painting with watercolor, John seeks out both lost and found edges. He intentionally balances controlled definition to help the viewer see with blurred edges to let them enter. His fresh traditional watercolors have broad appeal and can be found on many social expression products, including greeting cards, stationery and calendars. John is adept at keeping up with trends, making his work popular for framed prints and home décor. Painting is actually John’s second career. His first was as an art director and creative director for Hallmark Cards. He earned his BFA-Design from the University of Kansas. When he’s not painting, John enjoys working in the garden and playing the piano. He lives in Kansas City, MO, with his partner and their three beagles.